The tablet market heated up today with Barnes & Noble announcing the 7-inch Nook HD and 9-inch Nook HD+. The two tablets go head to head with Amazon’s recently unveiled 7-inch Fire HD and Kindle Fire HD 8.9”, as well as the iPad. From a hardware perspective, the new Nooks hold their own with, and in some cases eclipse, their competition. The iPad still rules in the display category with its 9.7-inch 2048 x 1536 pixel display, versus a resolution of 1920 x 1200 for Nook HD+ and Fire HD 8.9”. Pixel density is similar, with iPad at 264 ppi versus the Nook HD+ at 256 ppi and the Fire HD 8.9” at 254 ppi. Specs aside, the Nook HD+ display looks great and has impressive off-axis viewing. Processors also seem pretty much a wash, with all clocking in with 1.5Ghz dual-core processors and dedicated graphics processors. Since final hardware wasn’t available for my demo, it wasn’t able to judge its actual performance. Barnes & Noble chose to forgo cameras, while the Fire HD 8.9” sports only an HD front-facing camera and the iPad has a standard definition front-facing camera and a 5MP rear-facing camera. The lack of any camera earns the Nook HD+ a ding. In audio, though, the Nook HD+ excels with its stereo speakers enhanced by SRS, a technology that creates a bigger, fuller sound space. No, SRS is not just a gimmick. When listening to the Nook HD+, I was impressed by the big sound emanating from its small speakers. The Fire HD 8.9” also has decent stereo speakers but iPad has an adequate mono speaker. At 18.2-ounces, the Nook HD+ can claim the title of “lightest full HD tablet”—1.8 ounces lighter than the Fire HD 8.9” and 4.8 ounces less than the iPad. 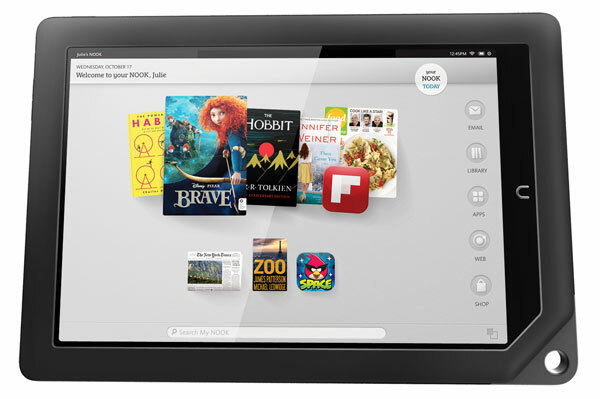 The Nook HD+ also has a microSD card slot, making it upgradable—unlike the iPad and Fire HD 8.9”. And, at $269 for a 16GB model, the Nook HD+ is less expensive than the $299 16GB Kindle Fire and $499 16GB iPad. The Nook HD (8GB, $199) fares well when compared to the Kindle Fire HD (16GB, $199). The Nook HD has a higher resolution display at 1440 x 900 pixels (versus the Kindle Fire HD’s 1280 x 800), has a slightly faster 1.3 GHz dual–core processor (versus the Fire HD’s 1.2 GHz dual-core) and weighs just 11.1 ounces (2.8 ounces less than the Fire HD). You get half the onboard storage with the Nook HD but a microSD card slot makes it expandable . One other small detail I liked—its wide bezel, which made the Nook HD easy to hold with one hand. Competitive hardware isn’t enough, though; it’s also about the apps and entertainment. 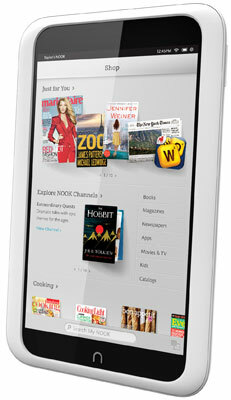 To address entertainment, Barnes & Noble announced Nook Video yesterday. The service will feature full HD 1080p content, which can be downloaded for playback offline and sent to an external display in 1080p using an optional HDMI adapter. (The Nook HD, which sports a 720p display can also send 1080p to an HDTV.) Barnes & Noble says it will have Nook Video apps for iOS devices, Android devices and computers. Nook Video will also manage UltraViolet-enabled movies and TV shows—the digital copies of movies you get when you purchase DVDs and Blu-ray videos and new digital-only UltraViolet purchases. On the app front, Barnes & Noble calls their selection “curated.” At 10,000 apps, it’s pretty small and is a weak point for the Nook HD and HD+. Like the Kindle Fire HD and HD 8.9”, the new Nooks support multiple profiles on one device, so Junior won’t stumble upon R-rated movies. You can manage child profiles by setting video rating limits, turning off Web browsing and managing access to purchases—either by preventing them or setting content and spending limits. The Kindle parental controls offer a bit more fine tuning, enabling you to set time limits by activity or time of day. The iPad doesn’t have profiles but will let you manage access to shopping, content by rating, Web browsing and taking pictures and videos. The Nook HD and HD+ are available for pre-order today and will ship at the end of October. I was wondering about this I’m looking for something for my 9 year old granddaughter the price sounds good also I think I’ll look harder. thoughts vs. Samsung galaxy or google tablet? We have a soon to be 10 year old son. Like most 10 year old’s he probably won’t use the tablet for mainly reading. How does it respond surfing the web? Is it fast? Does viewing a web page require a lot of scrolling? The amount of scrolling is based on screen size and resolution. So unless you’re zooming in, you should see a fair amount of the page. With a 1.5GHz processor, Web surfing should be smooth. How does Google’s Nexus 7 compare with these 3? The review was good as far as it went but was lacking in reviewing ALL aspects of the Nook HD & HD+. Is it fast? Does it lag? Can you open multiple windows? This is certainly an issue that should have been address in the review from a site specializing in technology. The Nook HD and HD+ models I saw were pre-production and I didn’t get a chance to experience all aspects of the tablet. We’ll do a full review when there’s final hardware available. I received a Nook Tablet last Christmas & it has been fun & very helpful for classes I took over the summer. My problem has been the lack of apps & the size still left me wanting an ipad. This new Nook HD looks good & the price point certainly makes me interested! I look forward to more details!!! Is it possible to root the HD and install Cyanogen MOD’s CM10? If so, does CM10 have full access to the hardware (Bluetooth, USB)? That’s not something we test, but perhaps a community member can help out. I would also follow http://www.xda-developers.com/ for updates on available mods (I don’t see anything there yet for the Nook HD). You probably know this already, but for the benefit of everyone else reading this, installing unofficial operating systems onto your device can void the warranty and, potentially, brick (permanently lock up) your device. So only try it if you know what you’re doing and are comfortable with the risks. I rooted my Nook Color almost two years ago and never looked back. I’m currently using CM10 and love it. I understand it’s impossible to brick a Nook Color. Isn’t this also the same for the newer tablets?